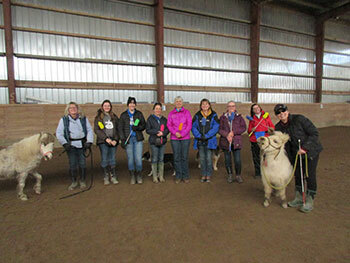 There is a Beatles song that keeps running through my head: “Eight Days A Week”…and even though I spent eight days away from home, it wasn’t enough time to spend with all the amazing people and horses (and ponies) I had the pleasure of introducing to Equispeak and the clicker training. I gave three clinics during the six days and a couple private lessons as well, so no wonder I was a bit tired when I arrived back home, but we were on “horse time” so the days just flew by. In the new format for the clinics, I give the participants a set of behaviours that they can take away and use in their daily work with the horses so, everyone is set up to succeed even after the clinic is over. I want to send them away with the ability to apply what they have learned about setting themselves and their horses up to succeed and how to break things down into little steps. It was so gratifying to see posts on Facebook that everyone had taken the work home and were applying it in their daily lives and seeing the amazing changes in their horses. It makes being away from all my horses so much more bearable! 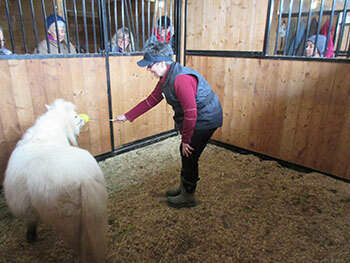 One participant used the targeting her pony learned to help her remain calm for the farrier. Another was so happy to not have to wade through the mud as now her horse would meet her at the gate and nicker to her, whereas before she could catch her, but had to go and get her. It was so great also to see people grow in their confidence with their horses and see the “bad horse” now as a horse struggling to understand and cope. I know there were many brains in the humans doing a lot of thinking and rethinking on things they saw and felt. 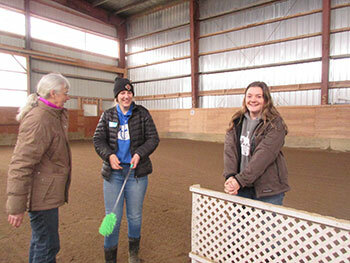 These photos were taken at the Maple Crescent Farm clinic on April 4-6 in Campbellcroft, Ontario.